I watched the movie Inside Out the other night. I cried. Pixar has a way of doing that to me. Within the first 5 minutes of Up, I was all in tears. Let’s not talk about all the feels I had watching Toy Story 3. I’m super excited for the upcoming movie The Good Dinosaur, but I’m afraid the good dinosaur will die and then I’m going to lose my cool. Alex and I ate these brûléed persimmon tarts as we watched the movie. Good thing. I definitely needed something sweet to brighten up some of the movie’s sadder moments. Movies like Inside Out make me unbelievably thankful to be done with childhood and adolescence. I don’t think I could handle all the drama, confusion, and hormonal changes all over again. Just when I thought summer was over… LA gets another heatwave. Luckily, my dad’s garden doesn’t care about the weather. Like clockwork, no matter how hot or cold is it, every September his persimmon trees begin bearing fruit. Lots and lots of fruit. Which makes me very, very happy. I love persimmons. I prefer to eat them raw, but when you have more than you can eat, it’s time to bake with them. 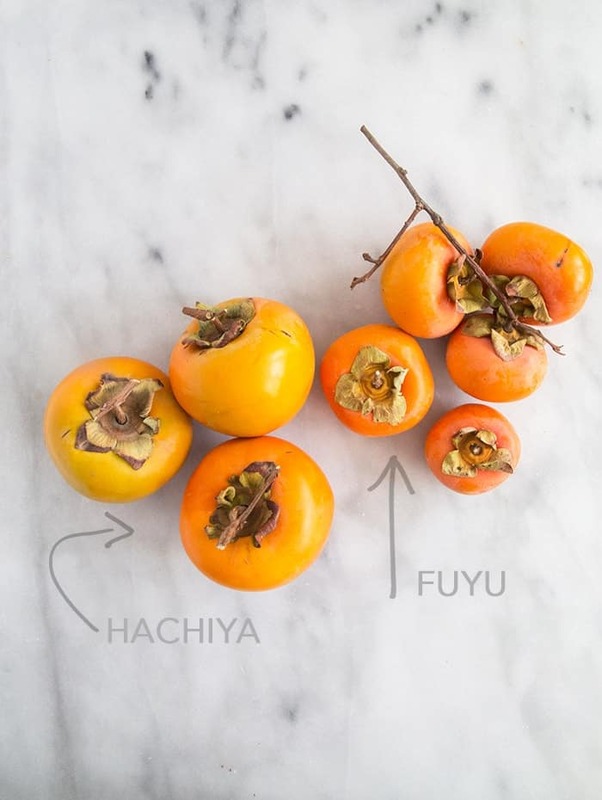 There are many varieties of persimmon, but the two most common in the United States are the hachiya and fuyu. The hachiya is elongated and acorn shaped. They taste really tart and chalky when firm and unripe. Let them ripen and soften a bit before eating. When ripe, hachiyas are super sweet and juicy. As a kid, I would freeze them and then slice off the top and eat the inside of the fruit with a spoon like sorbet. I find that hachiyas are best suited for baking. When soft, you can easily squeeze out the pulp and mix it into batters. I used the fuyu for this recipe. The fuyu is much smaller and flatter than the hachiya. It sort of resembles a tomato or a doughnut peach. The fuyu is a little less intimidating to those new to the fruit. They’re great to eat raw. It’s texture is a like a crisp apple. The fuyu is best eaten while it is still firm. I like to peel the skin and quarter the fruit into wedges. I rarely use fuyu for cooking. I find it’s better for snacking and salads. I was happy with the oat crust from my chocolate peanut butter oat tart, that I slightly adapted it for use here. I used these 4.75-inch tart pans. They’re nonstick with removable bottoms, making them a breeze to unmold any tart. In general, I’ve found that crusts for 9-inch fluted tarts translates well to fit four of these 4.75-inch tart pans. After baking the oat crust, let it cool to room temperature. Once it’s cool to the touch, fill the oat crust with maple cinnamon cream cheese. 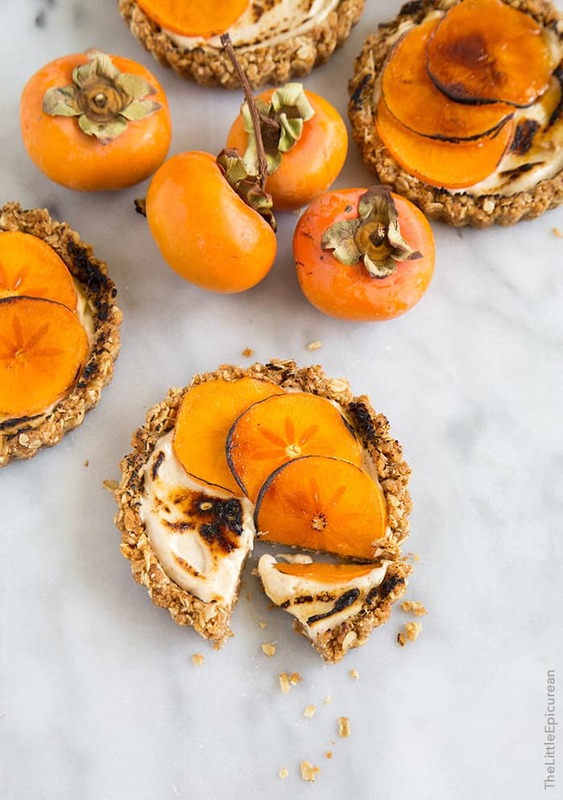 I thinly sliced some ripe fuyu persimmons and arranged them on top of the filled tarts. 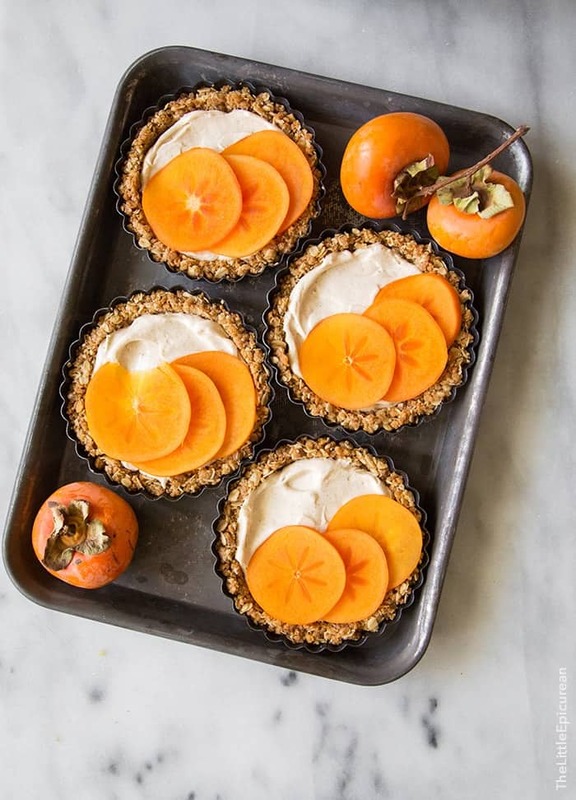 You cab cover the entire tart with persimmons, but I like the excitement of being able to see the filling. Right before serving, sprinkle superfine (or regular granulated) sugar over the persimmon slices and tart filling. Using a kitchen torch, brûlée the top of the tart, making sure not to burn the crust. Enjoy immediately! 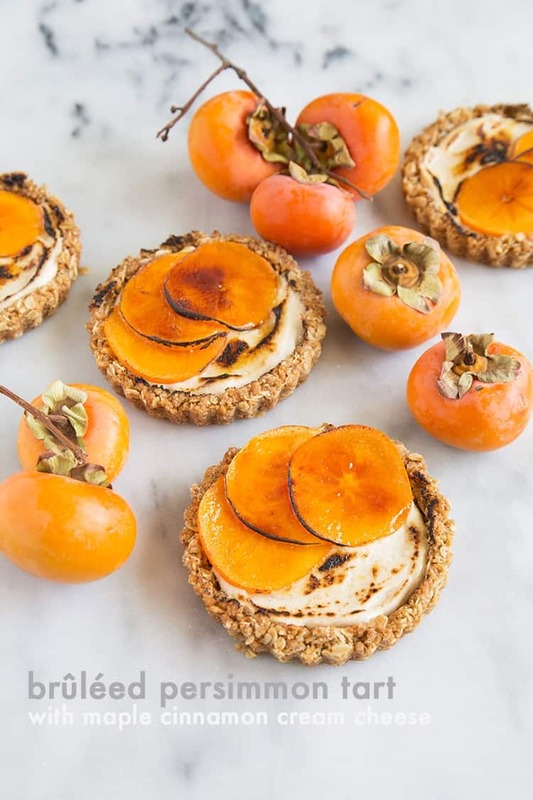 These persimmon tarts are a fun autumn dessert. It’s full of texture and different flavors to keep your palate entertained. 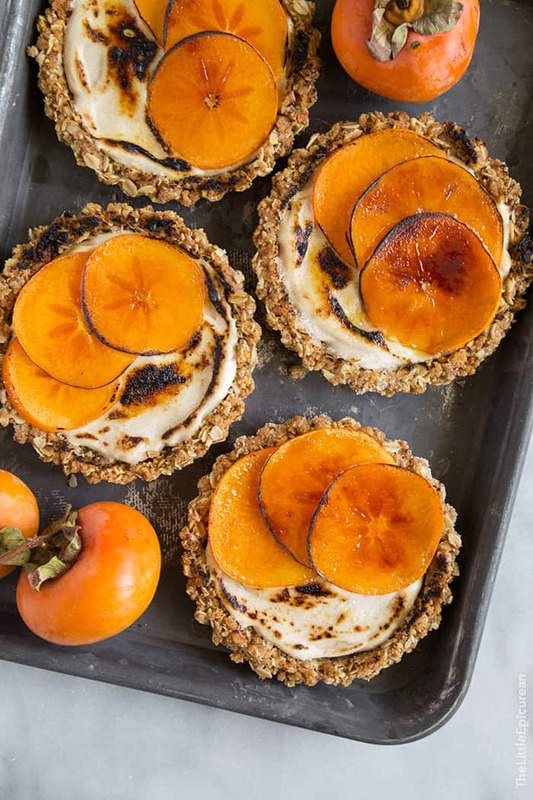 The crust is crunchy and delightful, the maple cinnamon cream cheese is warm and comforting, and the brûléed persimmon slices give the slightest hint of bitterness and a whole lot of sophistication. I think I’ll have to sneak one of these into the theater when I see The Good Dinosaur. Just in case… I need a little cheering up. Preheat oven to 350 degrees F. In a food processor, barely pulse together rolled oats, graham crackers, sugar, and salt. You do not want to end up with oat flour. Pulse just until the rolled oats are somewhat broken up. Add in melted butter and stir until mixture comes together. Press into four small tart pans with removable bottom. Bake for 12-15 minutes until crust is set and golden brown. Crust may slightly puff up during baking. Use the bottom of a glass or measuring cup to gently press crust into shell. Set aside and allow to cool to room temperature before filling. Whip cream cheese until smooth. Add maple syrup and cinnamon. Mix until incorporated. Add powdered sugar, vanilla and sea salt. Mix until smooth. Adjust thickness by adding additional powdered sugar a couple tablespoons at a time until desired sweetness/thickness is achieved. Fill cooled graham oat crusts with maple cinnamon cream cheese. Spread into an even layer. 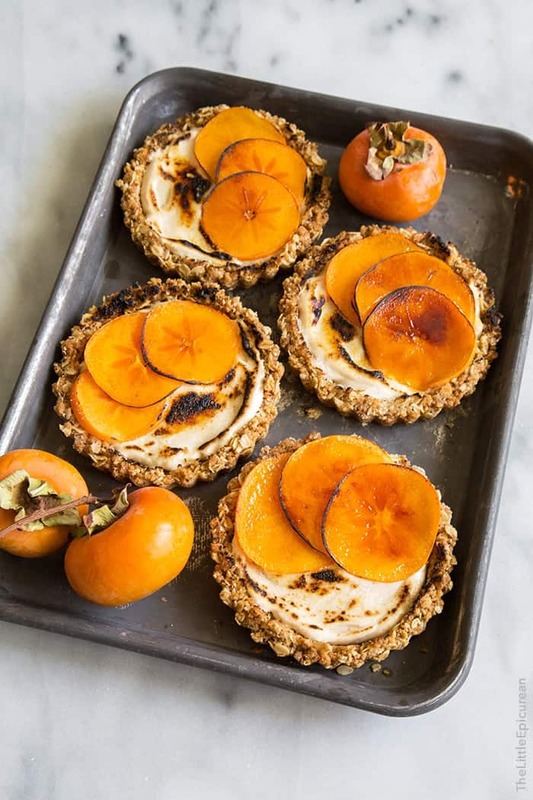 Arrange sliced persimmons on top of cream cheese. Keep chilled until ready to use. Before serving, generously sprinkle sugar over persimmon and cream cheese. Use a kitchen torch to brûlée the sugar, being careful not to burn the crust. Serve immediately. I can’t wait to try these! I’ve looked for some hachiya recipes around the web and here’s what I think’s going to happen to the ones I bought today. Big high fives on this one!!!! Just totally gorgeous! 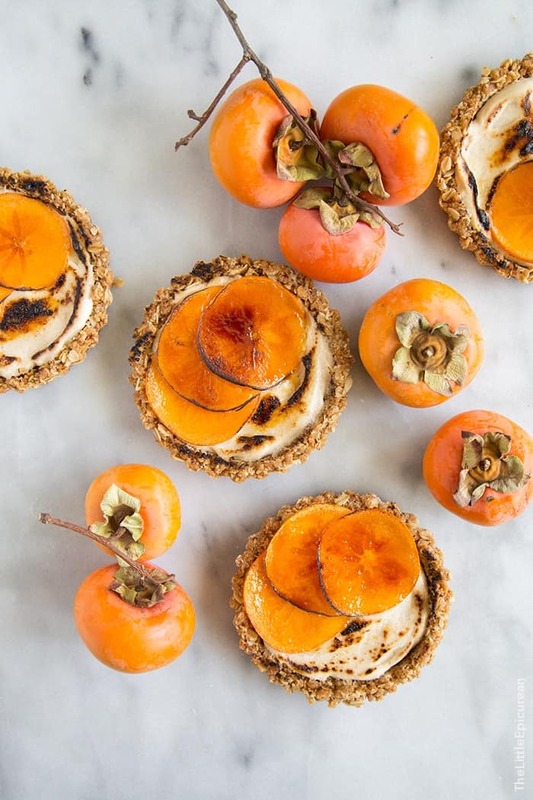 I’ve never tried persimmon but these are simply gorgeous! Ohmygosh! From top to bottom, these are just gorgeous! I love every part of them! I haven’t seen Inside Out, but it sounds like I need to put it on the list for those times that I’m craving a tear jerker. These tarts are beyond gorgeous – what an amazing dessert you’ve created! Boy do I feel ya on the Pixar thing. Nemo? IN TEARS. I am hoping to take my little guys to the Good Dinosaur but now I’m all worried he’s gonna die :P This looks fabulous by the way. Love the color! Persimmon in the UK are known as Sharon fruit.